BattleMech production began in the 25th century and continued with lightning pace until the collapse of the Star League. By the year 3050 few in the Inner Sphere understand the process of constructing new BattleMechs. Most have been handed down through the centuries, maintained and repaired with whatever tech is available. BattleMechs typically weigh between 20 and 100 tons, and fall into one of four weight classes: Light, Medium, Heavy, and Assault. Basic assumptions dictate that Light Mechs are quick, nimble, and lightly armored, while heavier 'Mechs have more room for equipment and armor. Light 'Mechs use speed to hide from detection while scouting ahead and employing hit-and-run tactics. Medium and Heavy 'Mechs are the most versatile classes overall, with Mediums slightly favoring speed over the firepower of Heavy 'Mechs. Assault 'Mechs are unmatched in size and offset their ponderous mobility with room for monumental arrays of weapons. Pilots use the MechLab to assemble, tune, and customize their 'Mechs. Equipment and armor is mounted to individual components, each with their own hardpoints that determine which types of equipment it can accommodate. 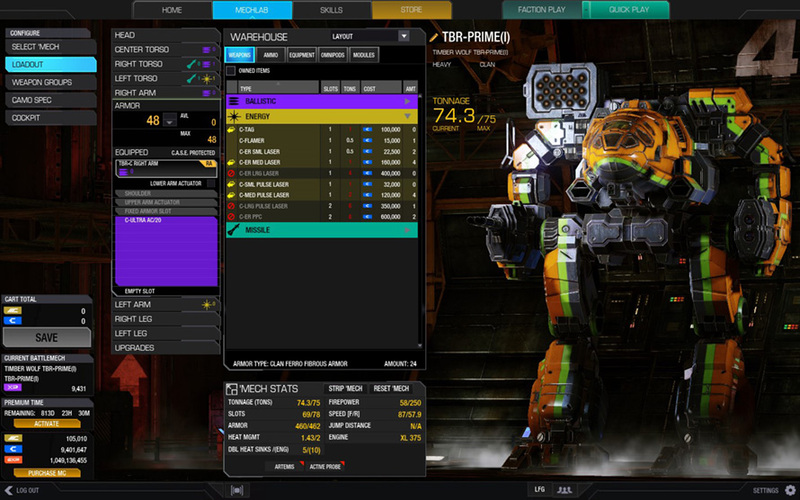 Selecting a 'Mech with the proper hardpoint configuration is the first step toward identifying builds that are viable for a given role. Soft restrictions like heat generation and ammunition capacity require experimentation to balance and tune. Bring to bear an array of close and long-range weapons, each with their own advantages on the battlefield. Ballistic weapons deal instantaneous kinetic damage but require careful consideration due to their reliance on ammunition. Energy weapons consume no ammo but generate significant heat that must be monitored to prevent overheating. Missiles come in both long and short-range variants, and are capable of striking out-of-sight targets with targeting support provided from friendly units. 'Mechs can mount a wide assortment of equipment to assist themselves and others. Jump Jets enable 'Mechs to vault to unreachable spots or slow their descent from large drops to minimize impact damage on the legs. Equipping Electronic Counter Measures (ECM) and Anti-Missile Systems (AMS) can protect nearby teammates from long-range enemy attacks. Heat Sinks and other passive equipment will help to ensure a 'Mech runs at peak efficiency. 'Mechs automatically share their targeting data with teammates, revealing the movements of enemies to allies. Moreover, 'Mechs with Long Range Missiles are able to strike targets far out of view using the data provided to them. Equipping ECM and long range sensors will ensure that prepared Scouts can see the enemy long before they themselves are spotted. BattleMechs, like their pilots, came to be recognized and feared for their combat prowess. 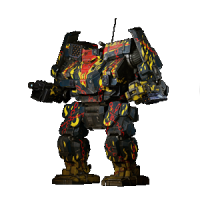 These Hero 'Mechs come adorned with vibrant camouflage and are instantly recognizable on the battlefield. Heroes are heavily altered variants of their base chassis, featuring unique appearances, hardpoints, and quirks. Hero 'Mechs are only available to players via premium currency (MC) or through special promotions. These variant 'Mechs feature loadouts crafted exclusively by the community, and are considered the premier chassis for new pilots. Throughout the year different Champion 'Mechs will be provided to players for trial use, but all Champion 'Mechs can be purchased through the in-game store using premium currency (MC). 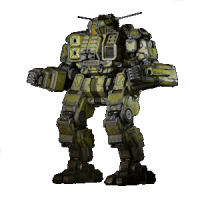 These 'Mechs possess a permanent boost to the amount of XP gained per-match, and provide a great starting point for any new MechWarrior.